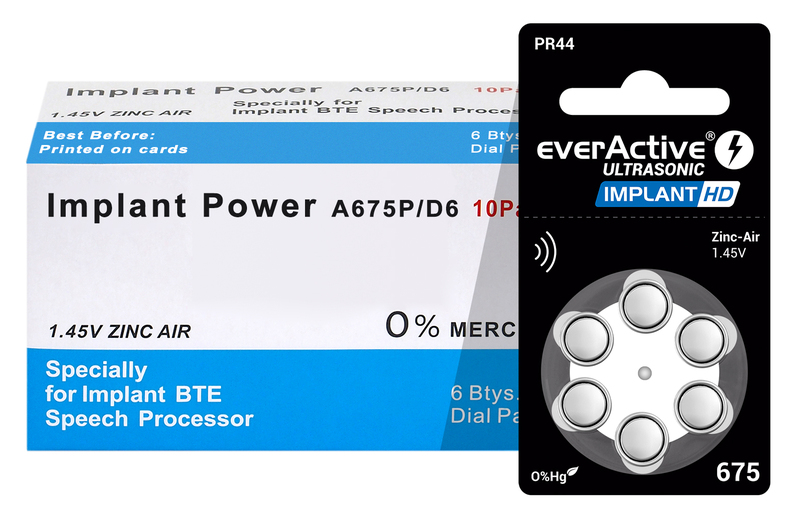 New powerful battery for hearing aids - everActive Ultrasonic Implant HD, type 675. These batteries are specifically designed for hearing implants, speech processors and other devices that refuse to work with standard, less powerful batteries. Like other products in the Ultrasonic line, the battery is made using innovative zinc-air technology. These special batteries use air for operation and in the result they offer few times greater capacity compared to any alternative batteries of the same size. Compared to standard zinc-air batteries, Implant HD batteries are much more resistant to high loads and increased power consumption of the most demanding medical devices. This is one of the best performing battery in this specific market area.